This article explains how the piano keys on a keyboard are arranged and the reason for it. You will learn the difference between white and black notes and there to find a certain note. A grand piano or an upright piano has 88 keys, which include seven octaves plus a few “orphans”. Many digital pianos have also full-size keyboards whereas other variants of keyboards do exist. Less expensive digital keyboards are equipped with lesser keys. In many cases is it alright to play songs and compositions on a keyboard with 44 or 49 keys, but in some cases it will lack keys (keyboards with 32 keys are also common, but are not recommended for anybody serious about learning to play the piano). See keyboard dimensions below. 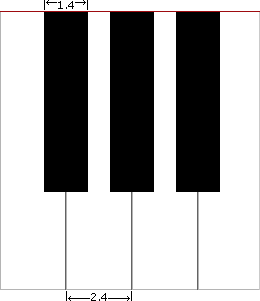 A piano can contain different numbers of keys and keyboard sizes since there are only twelve different tones, which are repeated with diverse pitches. A pitch is the frequency of the sound measured in hertz, but it is easier to think of low, mid and high ranges. On the left side of the keyboard is the low ranges (bass) and to the right side the high ranges (treble). On the picture above, you can see the placements of the C note and how it is repeated in different octaves (the interval between two notes of the same kind). So, when playing a C on the piano, you have seven alternatives – in most cases you will choose between the mid-range alternatives. Sometimes the placement of the notes are referred to as C1, C2, C3, C4, C5, C6 and C7. C4 is consequently the C note on the fourth octave. Of course, there are more notes than C. On the picture below you can see all the notes that belong to the white keys on the piano. 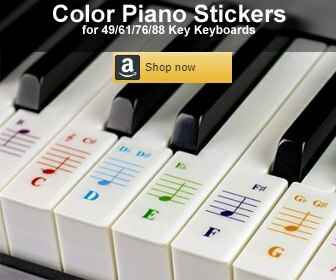 These notes keep the same relation to each other over the keyboard, and therefore you could always find a D to the right from a C. Notice that C and F notes are easier to spot because they are placed directly before groups of two and three black keys. The black keys repeat in patterns of two and three note groups over the keyboard. A full-size keyboard has 88 keys, including 52 white and 36 black keys. Concerning dimensions, the standard length for the overall of the keyboard is circa 123 cm (48 inches). For the keys the dimensions are circa 2.4 cm (0.9 inch) width for white keys and 1.4 cm (0.6 inch) width for black keys. The dimensions vary some depending on models and manufactures.